The bar graph given below shows the percentage distribution of the total production of a car manufacturing company into various models over two years. What was the difference in the number of Q type cars produced in 2000 and that produced in 2001? 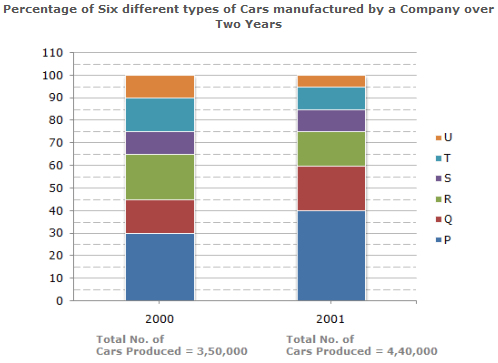 Total number of Q type cars produced in 2001 =(60 - 40)% of 4,40,000 = 88,000. Total number of Q type cars produced in 2000 =(45 - 30)% of 3,50,000 = 52,500. Therefore Required difference = (88000 - 52500) = 35,500. Total number of cars of models P, Q and T manufactured in 2000 is? In 2000 : Total number of cars produced = 3,50,000. P = (30 - 0)% of 3,50,000 = 30% of 3,50,000 = 1,05,000. Q = (45 - 30)% of 3,50,000 = 15% of 3,50,000 = 52,000. R = (65 - 45)% of 3,50,000 = 20% of 3,50,000 = 70,000. S = (75 - 65)% of 3,50,000 = 10% of 3,50,000 = 35,000. T = (90 - 75)% of 3,50,000 = 15% of 3,50,000 = 52,000. U = (100 - 90)% of 3,50,000 = 10% of 3,50,000 = 35,000. In 2001 : Total number of cars produced = 4,40,000. P = (40 - 0)% of 4,40,000 = 40% of 4,40,000 = 1,76,000. Q = (60 - 40)% of 4,40,000 = 20% of 4,40,000 = 88,000. R = (75 - 60)% of 4,40,000 = 15% of 4,40,000 = 66,000. S = (85 - 75)% of 4,40,000 = 10% of 4,40,000 = 44,000. T = (95 - 85)% of 4,40,000 = 10% of 4,40,000 = 44,000. U = (100 - 95)% of 4,40,000 = 5% of 4,40,000 = 22,000. If the percentage production of P type cars in 2001 was the same as that in 2000, then the number of P type cars produced in 2001 would have been? If 85% of the S type cars produced in each year were sold by the company, how many S type cars remain unsold? and number of S type cars which remained unsold in 2001 = 15% of 44,000. 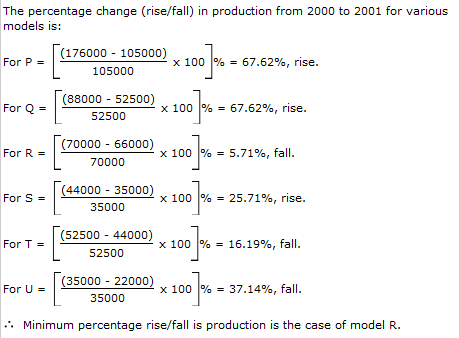 For which model the percentage rise/fall in production from 2000 to 2001 was minimum?